My overnight pack was all ready for a few days on the South Olympic Coast. With 20 minutes left before I would leave the farm and catch the outgoing bus; I received an email invite for a different type of adventure. The correspondence was received from an old friend of mine that in my eyes is an Olympic legend. He had a recent surgery and was looking for some trail time up at Hurricane Ridge. Our day would lead us on a 6 mile snow traverse. Doing this without the need of snowshoes, because of solid snow pack. The route lead us to the top of Hurricane Hill with views of the Bailey Range, Mt. Angeles and Mt. Baker. 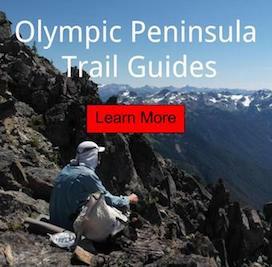 This route also lead us on top of the Pacific Northwest Trail. Headed out - views of the Bailey Range - wearing the new VFF EL-X and Gossamer Gear Minimalist. 'Booting out' - views of the Bailey Range. Headed up the ridgeline - views of the southern Olympics. Looking southwest on top of Hurricane Hill - view of the Upper Elwha Valley and the Bailey Range. While taking in the views. Some other friends showed up; which was a surprise. We ended up spending over a hour have a local hiker luncheon social. Discussing trips planned for the summer from various parties. Perfect way to spend the afternoon, with breathtaking views. On the way back to the trailhead; we decided to take it easy. This would allow us to catch sunset near the truck. Glad we stuck around; one of the best sunset I've seen in months. Sundog - shot by Greg. Setting up for the second shot. Sunset - photo by Greg. Hanging out in my Luna Sandals for sunset. Looking southwest from Hurricane Ridge Lodge. Browns Outdoor in Port Angeles for the rental; even tho Snowshoes were not worn. Greg for the invite and donating his superb photography to share on this blog. Overall this was a lovely trip into the mountains. It was cool to watch sunset at the Visitors Center, instead of watching it on the Hurricane Ridge Webcam. I plan on doing this type of adventure again.